Cotton Gottlob and Coach Red Pierce Were a Heck of a Team. Unlike the monjo-sized players, Walker was 5�11� and weighed a mere 173 lbs. 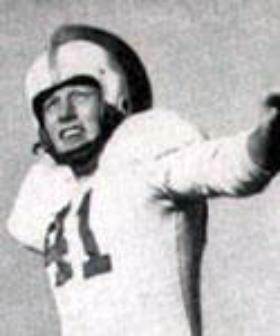 Nevertheless, Walker, who played for SMU, won the Heisman Trophy in 1948. Four years later, a baseball player from Galveston�s Ball High, Don �Cotton� Gottlob, talked Sam Houston State Teachers College�s coach, Paul �Red� Pierce, into letting him try out for quarterback. Maybe he saw a Doak Walker mentality in Gottlob. After all, Cotton Gottlob was only 5�9� tall and weighed in at a mere 165 lbs. Coach Pierce had inherited a football program that had only accomplished a one above .500 season record since 1946. Even though the Sam Houston Bearkats record couldn�t get much worse, most sports fans wondered at the wisdom of installing the 5�9�, 165 lb. Gottlob on the first string at all, much less as the quarterback. What Cotton Gottlob didn�t have in size, he made up with a combination of tenacity and talent. And before it was over, he had broken every passing record at Sam Houston and the Lone Star Conference. It was the bottom line that was the most important: This guy could pass the ball. One time Coach Ted Jefferies brought his Stephen F. Austin State College team to challenge the Bearkats after SFA�s big victories against Southwestern Louisiana and Sul Ross. Within moments of the start of the clock, Gottlob threw an 81-yard strike to fellow player, Dub Allee, and just like that, it became the third longest touchdown pass in Sam Houston�s history. The Bearkats won that game 33-20. During his three seasons at Sam Houston, the school�s record book says Gottlob completed 234 of 517 passes for 3,832 yards and 33 touchdowns. Nearly 60 years later, he holds the SHS �s seventh highest career �total in passing. Here are the bottom line statistics: Letterman 1950-1952; NSIA All-American 1952, All-Lone Star Conference 1950-1942, and he was the Berkat�s quarterback of the 1952 Shrimp Bowl�s championship team. Along the way, a pretty co-ed named Janelle Kingsbury caught his eye. Fellow student, Dan Rather, was dating her. Never one to back down from a challenge, within next to moments, Cotton Gottlob had won Janelle�s heart away from Rather, and they married. The Gottlobs professional careers began and ended within the ranks of the Galveston Independent School District where they taught others the art of believing in themselves.